Use this feature to evaluate curvature extremes of a surface. When selected, a report of the surface evaluation will be displayed. When selected, the faces being evaluated will be displayed using the current system color attribute. Specify a curvature option. 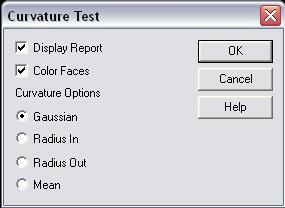 The following options are available: Gaussian, Radius-In, Radius-Out, and Mean. Select Curvature Extremes from the Tools>Verify submenu. The Curvature Test dialog appears (see above). Configure the dialog settings as you wish and click OK when done. Select the faces/edges to find the curvature of. Click the ACCEPT button when you have finished selecting. 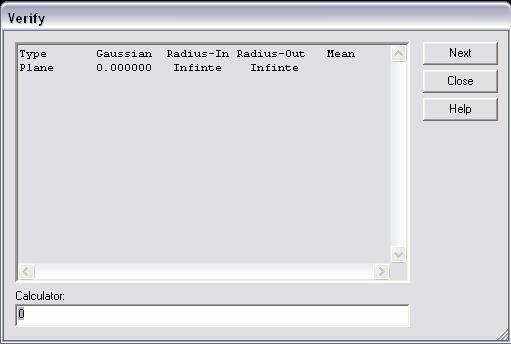 The Verify dialog appears, displaying the Type, Gaussian, Radius-In, Radius-Out, and Mean data for the selected entities. Click NEXT to return to the Curvature Test dialog, or CLOSE to end the function. The Verify dialog will list all selected face types and their subtypes if they are a spline surface. It then lists the Gaussian curvature with the largest absolute value, the smallest radius of curvature in the opposite direction of the face normal, the smallest radius of curvature in the direction of the face normal, and the greatest mean curvature. NOTE: The further the Gaussian curvature is away from zero, the more doubly curved and less flattenable the surface is. The radius-in value is how far one can offset a face in to the body without a self-intersection. The radius-out value is how far one can offset a face out of the body without a self-intersection. The mean curvature is a measure of how minimal the surface is in a soap bubble sense.